Aside from our weigh filling, bagging, wrapping, and corrugate solutions, we also have conveying solutions wherein it consists of three parts, conveyors, bag collating and container filling solution. For our container filling solution, we provide three container filling machines manufactured by our partner, WeighPack Systems. This container filling machine is constructed with a stainless steel frame that can be easily partnered with any auxiliary filling machine. It is designed to automatically index and fill rigid containers including clamshells, bottles, jars, and cans. Perfect for filling containers with candy, chocolates, snack food, nuts, powders, hardware, and so much more, Container Indexing Conveyor can fill even plastic, cardboard, metal or glass containers engineered to fit your production needs. Its standard features include AC variable speed drive, adjustable guide rail, no container-no fill, sensors for container positioning, adjustable leveling pads, a Pneumatic indexing mechanism, and air regulator, lubricator, and filter. With our Box Indexing Conveyor, you can now automatically fill your corrugated boxes, trays, or rigid containers. Designed to be easily integrated with any filling device, this container filling machine has proved to be engineered with service in mind. In addition, it is equipped with real-time communication between machines so as to optimize cycle speed. Its standard features include a stainless steel frame, variable speed control, no box—no fill signal, adjustable sensing devices, adjustable leveling pads and guide rails, and 1/2 hp motor & gear. Designed to fill challenging product (i.e, light, irregular, or tight-fitting items) into rigid containers, the SpinDexer is optimized to increase throughput with a production speed of up to 100 cycles per minute. The Spindexer is ideal for snack foods, confections, pharmaceuticals, nutraceuticals, coffee, tea, spices, and powders. Moreover, it features a tool-less removable funneling and star wheel for easier and faster access and for sanitation purposes. 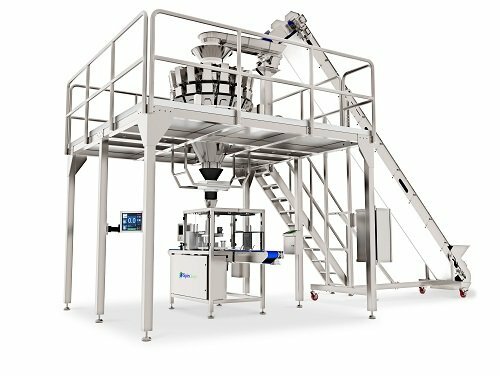 Available in 12, 16, and 24 stations, this container filling machine is made with the state-of-the-art servo drive technology to provide total control of the container. On top of that, it is fully enclosed with Lexan safety doors and is built with food grade materials and stainless steel contact parts. Other features include PLC-based controls, single station fill spout, variable speed infeed/discharge conveyor, no container—no fill sensor, color HMI, full adjustable side rails, anti-vibration leveling pads, and safety switches & E-stop.